Nice and clear post! 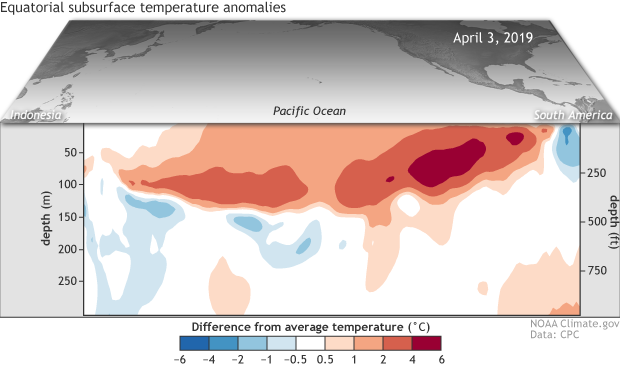 Could be possible to update figures of 2015 post by Michelle L'Heureux (https://www.climate.gov/news-features/blogs/enso/d%C3%A9j%C3%A0-vu-el-ni...), including last years, specially 2015. 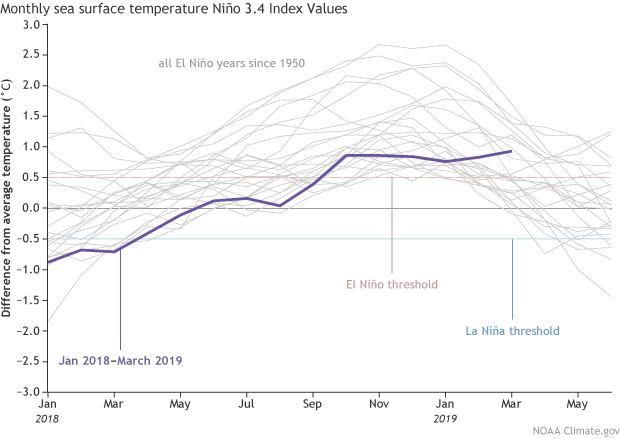 Which are some reasons we're not, at this point, expecting a particularly significant El Nino if it were to continue (not like 2015-16 which was a top three event). Details in NMME ENSO e Models (ECMWF, UKMO, BOM , JMA) at Climate Model Summary of Australia. Much appreciated! Emily does do an awesome job w/ these top of the month posts, that's for sure. Very nice writing and explanations. How can you tell whether the warming is due to a Kelvin wave or the warming is due to something else like lack of upwelling? Is it the size of the anomaly? The warming impacts from downwelling Kelvin waves are not instantaneous so we can track their journey across the Pacific Ocean. 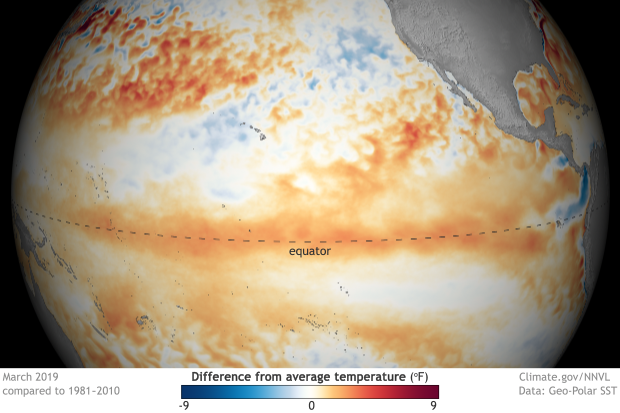 From there, we can time when its influence might begin to show up in the metrics we use to measure ENSO. A lack of upwelling and a weakening of the trade winds can also cause surface warming too and also can be monitored through buoys in realtime. Oftentimes, you might see both occurring at the same time. What lurks beneath this time? The temperature cross-section of this looks a lot like the one you showed us in your April 12, 2018 post. This time is it a whale shark instead of a great white? RE: What lurks beneath this time? Haha! We'll see if we can get the graphics folks to help us out with a whale shark graphic next time. Thank you all for a very readable article! I now think that I now better understand the importance of the ENSO work and the effects of the phenomena on our weather. Ms Becker, thank you for your excellent, clear writing. I visit Christmas Island twice a year for fishing, so I value tremendously the analysis that you provide. Even if it’s not always what I want to hear. Previously on the blog, guest author Dr. Kim Cobb wrote all about Kiritimati Island and the impact warmer than average ocean waters have had on corals.